Senator Maggie Hassan visited Titeflex Aerospace on Tuesday. The NH Tech Alliance will host the 2018 New Hampshire Speed Venture Summit on Wednesday, Nov. 28 at the Manchester Country Club in Bedford. All startups, investors, ecosystem partners and tech influencers are welcome to a networking reception at 5 p.m., followed by a fireside chat with early-stage venture investor Deb Kemper of the Boston Forum of Golden Seeds. There will be several regional investment firms attending, including 10X, Alumni Ventures, First Run, Impact NH Fund, North Country Angels, Northeast Angels, Rines Fund, Side Car Fund, Wasabi Ventures, Maine Angels, Valia Investments, Hypertherm Ventures and some individual investors. For tickets, click here. Hypertherm, a Hanover-based manufacturer of industrial cutting systems and software, recently announced the formation of Hypertherm Ventures, a new corporate venture capital arm, to foster greater interaction with the technology venture community. Encompassed by a goal of helping advanced manufacturing deliver positive change to the world, Hypertherm Ventures is seeking partnerships with universities, startups, entrepreneurs and early stage companies to commercialize advanced manufacturing technology in strategic interest areas. Those areas include industrial cutting, welding, and thermal processing; robotics and automation; machine learning and augmented intelligence; industrial Internet of Things; additive manufacturing / 3D printing, and nanotechnology. To learn more about Hypertherm Ventures, submit a proposal, or download a pitchbook, please visit http://www.hypertherm.com/ventures. 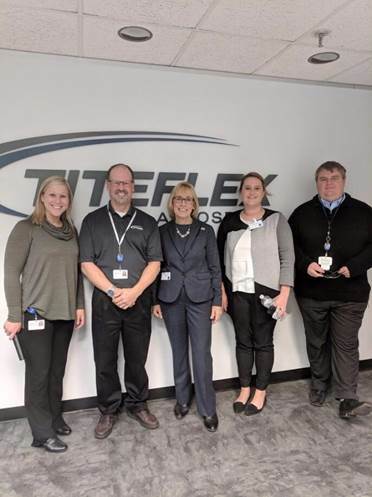 On Tuesday, Senator Maggie Hassan visited Titeflex Aerospace, a manufacturer that provides aerospace support through fluid transfer solutions in a variety of assemblies, recognizing the innovative business for its work supporting the military and NASA, while creating good jobs in the region. Senator Hassan also discussed her efforts to build a stronger workforce in New Hampshire, and noted that Congress funded the Defense Department on time this year for the first time in a decade, and how important that is to our national defense and innovative defense contractors. The deadline is approaching for the Social Venture Innovation Challenge, an annual event hosted by the Center for Social Innovation & Enterprise at the University of New Hampshire. The SVIC is an idea-stage competition that engages students, alumni, and NH community members to solve pressing environmental and social problems by designing novel, sustainable, and business-oriented solutions. The deadline for written proposal and video submissions is Wednesday, Nov. 7 by 10 a.m. EST. To register, click here. Finalists will compete on Thursday, Nov. 29. Bedford-based RedBlack, LLC, an independent market leader in investment management solutions for rebalancing, order management and trading, today announced a multi-year extension of its alliance agreement with SS&C Advent, a division of SS&C Technologies. SS&C is a global provider of investment and financial software-enabled services and software for the global financial services and healthcare industries. Senet, Inc., a Portsmouth provider of cloud-based software, global connectivity service platforms and network build-out for the Internet of Things, has announced that its Low Power Wide Area Virtual Network (LVN) has been selected by Mobile Breakthrough as the winner of its Industrial IoT (Internet of Things) Solution of the Year Award. The Mobile Breakthrough Awards recognize the top companies, products, innovation and people in the mobile and wireless industries today. Among 2,200 nominations submitted for this year’s program, Senet joins an impressive list of 2018 award winners, including Cisco, Samsung, Sprint, Verizon, VMware, Vodafone and Vonage. Senet's LVN was recognized earlier this year, having been named IoT Product of The Year by IoT Evolution and recognized by Frost & Sullivan as a Technology Innovation Award. Ahead of the Product of the Year event, finalist Waypoint Robotics used one of its Vector robots to deliver the Product of the Year award from a meeting room at Manchester Country Club to trophy designer Pepi Hermann's car. This year’s first place Product of the Year winner was Measured Air Performance of Manchester, which developed a monitoring system that measures the cleanliness of laboratory exhaust air. The award is displayed at the Manchester-Boston Regional Airport. Joshua Cyr, director of education and acceleration at Alpha Loft, will host a Pitch 101 session at Jupiter Hall on Thursday, Nov. 8 from 5:30 to 7:30 p.m. Startups, especially those preparing for the Speed Venture Summit, TechOut or the Social Venture Innovation Challenge, will benefit from this session focusing on investor pitching and pitching to first customers, employees and partners. Participants will learn core concepts around storycrafting, core messaging, physical presentation and more. As Consolidated Communications works to upgrade 500,000 total customer locations this year, the company announced that more than 365,000 residents and businesses across Northern New England now have faster broadband speeds. Residents and small businesses across Northern New England will be able to get speeds two to three times faster than what was previously available. Additionally, businesses are benefiting from new services, such as: Consolidated’s Distributed Denial of Service Mitigation (DDoS), a solution that monitors, detects and mitigates the most complex DDoS attacks; SD-WAN, a software-based network technology that provides a simplified management and automation of WAN connections; BusinessOne, a high-speed data and voice solution designed for small and medium-sized businesses; MPLS (Multi-Protocol Label Switching) offering businesses fast, flexible, and secure data transmission for their WAN needs and Cloud Peer Connect, direct, private access to major application service providers. Learn more at www.consolidated.com/progress. Five finalists have been selected by an esteemed panel of judges to compete for up to $300,000 in investment capital prizes and free office space at New Hampshire Tech Alliance’s 2018 TechOut competition on Thursday, Nov. 15. The event, which includes live pitches from the finalists, an unveiling of the winners, networking and refreshments, will run from 5:30 to 7:30 p.m. at Oracle + Dyn in Manchester. Click here for tickets. TendoNova Corporation, presented by CEO Roy Wallen, has created the Ocelot system, a novel medical technology that addresses chronic tendon pain at lower costs in clinical and office-based settings. The company’s technology meets the needs of physicians, payers and patients by improving clinical outcomes, improving patient experience, decreased cost of care and improved physician experience.